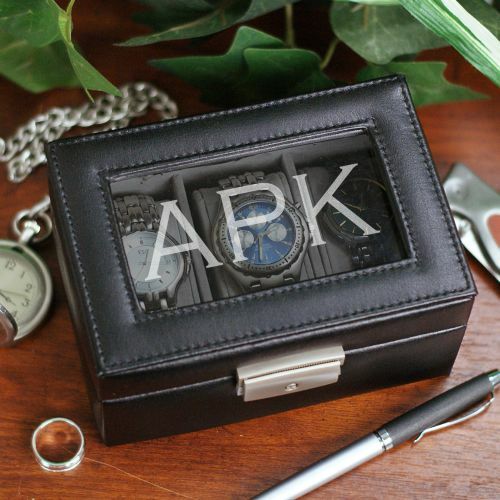 Personalized Executive Watch Display Case. This is the luxury you are looking for to store your fancy watch collection. The watch box creates a timeless masterpiece keepsake with a luxury taste and feel. The Watch box is the perfect gift for any wedding, groomsmen, birthday, father day, or any occasion. The Watch Case box, with its effortless style and executive flair, provides an elegant way to display 3 timepieces, making it a necessary part of any collection. The Box has a sleek design measures 6 x 4 1/16 x 3 1/4, has a premium leather finish on the outside and a felt lining on the inside. This Leather Watch Case holds five watches and includes a lock key. Personalize with any three initials.